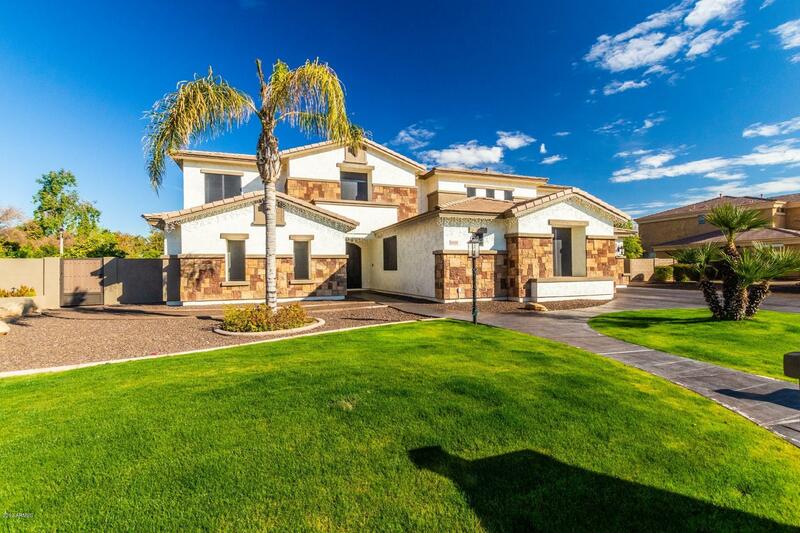 Incredible remodeled estate on almost 3/4 of an acre in gated Litchfield Park community. Custom iron double door entry opens to 2 story great room with grand staircase. Spacious kitchen features custom solid wood cabinetry, quartz counters, double ovens, gas cooktop, built-in refrigerator/freezer, and walk-in pantry. Luxurious first floor master offers dual vanities plus makeup vanity, walk-in shower, soaking tub, and dual walk-in closets. First level also contains office and additional bedroom. Second level offers loft space overlooking great room along with media room. Upstairs bedrooms split in 3/2 format with each side containing a full bath. Incredible backyard with heated pool, in ground spa, covered patios, outdoor media area, RV gate, and plenty of grass to play. A must see!